Quietly through the last decade, unnoticed by most, board gaming has enjoyed a resurgence in popularity. It may be the result of a down economy (meaning people want to entertain themselves at home more), or a global marketplace that allows for easy and affordable small-time manufacturing, or perhaps, ironically for a hobby that doesn’t involve electricity, the Internet, which more than ever is making it easier for people to share experiences and to meet others with similar interests. As a child I played board games with my siblings endlessly but I eventually moved on from the world of cardboard and plastic, only occasionally playing card games. A love of competition and solving puzzles never truly left me however, and much later as an adult a friend got me back into my old pastime by asking if I would be interested in playing a new board game he had purchased: it was German. New board game classics have been born from an immense international community, particularly from Europe, and especially from Germany where the largest board game convention in the world is held annually in Essen. From this devoted community whole new genres of board games have emerged and older genres have expanded and been refined. Now games for all audiences are more readily available than ever, from bawdy party games, to serious hours-long strategic campaigns. When the play title Wallenstein was first quietly passed around the Shakespeare Theatre Company offices as a possible production for our 2012-2013 Season, my first thoughts weren’t of Friedrich Schiller, but of an announcement I had seen on a website that a second edition of a game sharing the same name was available for pre-order. After verifying that the play and the board game were about the same Wallenstein, my credit card couldn’t have come out of its wallet any faster. Ideas flew through my head about all the fun ways I could tie the two together but I was nagged by a doubt, a question that’s hard to answer, and one that makes people who review board games shudder: would the game be any fun to play? The object of Wallenstein the board game is to earn as many victory points in eight rounds of play as possible. Each round represents a season, with spring, summer, and fall being action rounds and winter being a scoring round; a game session represents two years. During action rounds players may execute ten actions, including, for example, erecting special buildings, recruiting new armies, taxing citizens, and attacking other players’ territories. When winter arrives, players earn victory points based on the number of territories they control and from the buildings they’ve erected. Wallenstein is particularly remarkable in how it randomizes and masks the decisions players must make. The order in which players may take their ten actions changes every round, with five of the actions completely hidden until the first five are executed. Other mechanics, like player turn order and events that modify certain rules, are also randomly selected every round. These changing elements create a process that seems overwhelming at first but ultimately have players make interesting decisions that play out in exciting ways. While learning and playing Wallenstein I was fascinated with how it blends conquering territory with a traditional “euro” game style. Without diving too far into the semantics of board game genres, there’s a particular European style of game design that focuses on smart game mechanics and balanced, straight-forward game play. Typically these games don’t feature a lot of confrontation between players and are often accused of being barely a step above solitaire— allowing that you may occasionally catch an angry eye from someone else at the table for doing something they wanted to do. At its core, Wallenstein is based on the design philosophies of that genre but also incorporates conquering and holding territory into its game play by use of an unusual device: a cube tower. This tower of cardboard and plastic has little “traps” inside it. When two players commit their forces to battle, they dump the cubes representing their armies into the tower and only some cubes come out. The majority wins the fight and the missing cubes stay in the tower. Interestingly, this device makes losing a fight a bit more palatable since you’ve not completely lost those forces—they’re likely to tumble out in a later battle, tipping the odds in your favor that time around. In my sessions with Wallenstein this unique mechanic for resolving combat effectively assuaged friends who don’t like confrontation in games since we all had a lot of fun dumping cubes into the tower and seeing what came out. As I continued to enjoy my time with Wallenstein I wanted to learn more about the game’s history and to find out why the game was named after a German general who seemed to me to be an obscure historical figure. 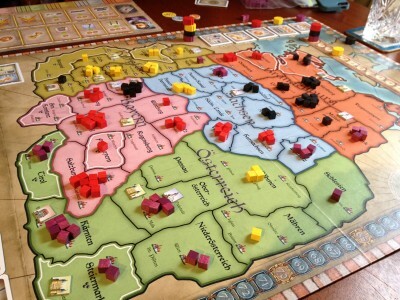 Later when considering that the game’s publisher, Queen Games, is based in Germany and that the game’s designer, Dirk Henn, is German, the connection to Wallenstein, the man, made a lot more sense. I reached out to Dirk via email with a few questions which he kindly answered. Austin Auclair: Can you tell us a little about the history of your game Wallenstein? How did the first edition come about? Dirk Henn: I was working on the game and was looking for historic scenery, where there were many different people with many different individual interests and aims, for it was a game for up to 5 players. In most of the conflicts in history there are only two opponents, who perhaps have some allies if you are lucky. And I needed a territory that had to be compact – not, for example, Europe with all its extreme extensions. At last I came along the 30 Years’ War, where there were many nearly independent warlords who fought each other and moved around Germany, trying to fulfill their own aims, political and monetary, always pretending to fight for their religion. Auclair: What brought Wallenstein back around for a second edition? Henn: Wallenstein was republished after some years, because people always asked for it. Europeans tend to think it is easier to visualize the locations of Wallenstein. If you put a church in a town, Cologne, for example, you see the Cologne Cathedral in front of your eyes. Auclair: Wallenstein creates a tremendous sense of uncertainty every round by randomizing and hiding elements, such as the order of actions you may take and the effect that events have every season. These changing variables could easily cause “analysis paralysis” with players, yet while I have only yet played with experienced gamers, our sessions have been very smooth with only a little decision-making despair. When designing Wallenstein, did you set out with specific mechanics in mind or did they evolve while trying to reach a particular design goal? Henn: My aim designing a game is that people enjoy playing the game. Sometimes I tried to aim at a certain kind of game, and in the end it was something quite different, and I was disappointed. Until the other people who did not know about [my] aims just played it and had fun and liked it very much. So – aiming seems not to be good for me. And what I like with this game [is that] everybody does their thinking at the same time. So you don’t have to wait for one [player] after the other [to plan their turn]. This planning phase was the first part of the idea about the game, before the rest came up. Auclair: I have to ask about the cube tower! I absolutely love it. Having played Wallenstein with people who do not like games with a lot of confrontation, it does a remarkable job making “combat” not seem so scary. How did the idea of the cube tower come about? Henn: Now I am afraid that I will have to disappoint you. The idea for the tower was not mine, but Ronald Hofstadter’s. I only used the idea for my game – for the reasons you explained above. It was just perfect to avoid long calculations or dice throwing sessions for deciding a combat. Auclair: My first session with the game I lost quite badly since I focused too much on conquering territory and not enough on erecting point-earning buildings— it seems I have spent too many years playing games like Risk and Axis and Allies. Was it tough to strike a balance between territory control and the “euro” style of mechanics-driven design? 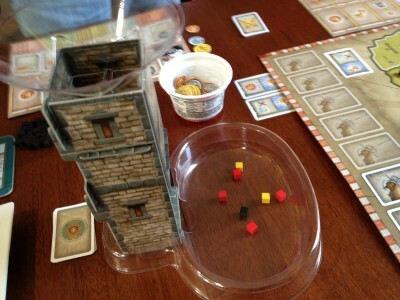 Henn: Nice thing: In our first game everybody did erect buildings and had wonderful realms. Except one guy. He moved around the map and seized everything that was precious—and won the game by far. In the following games everybody was aware of him and protected their territories, and he did not win again so easy. But I wanted to get the game away from games like Risk, where you easily know what to do – conquer as much as you can. I really wanted to give the player an alternative way of winning the game, a more defensive and constructive one. And when the girls in my testing groups liked the game, too, I knew that it was as I wanted it to be. Austin Auclair: Thank you for your time Dirk. I look forward to playing your future projects! Wallenstein may be a little much for people whose board game experience stops at Monopoly, but if you’re looking for something a bit more challenging the next time you get together with friends, it’s worth checking out—especially after you’ve seen the Shakespeare Theatre Company’s play! When you’re next at a bookstore or a big box store, take a look at their board game shelf. I guarantee you’ll see many titles that you’ve never seen before. They’re the new classics, designed and enjoyed by people all over the world, and they’re a lot of fun. Join the Shakespeare Theatre Company, Labyrinth Games and Puzzles and the Goethe-Institut for a special Wallenstein-themed game night! Learn more. Austin Auclair is the Associate Marketing Director at STC. He loves board games and his wife has been very patient with him taking up an entire bookcase in their living room with his collection.